Selecting the right venue for your event is extremely important, and there are many factors to consider. Primarily you must have confidence that the professional staff will exceed your expectations of providing your group with a fun, enjoyable golf experience and a “can-do” attitude of service to back it up. That is why Heritage Isles is a popular choice for tournaments, outings and staff/family fun days. Whether the outing is for client appreciation, a 144 player charity tournament, and 16 guys on a golf getaway or just a company fun day, our staff will work hard to ensure your complete satisfaction. More and more corporations, associations and private groups choose us each year and return to Heritage Isles again and again! Please consider the following factors for choosing Heritage Isles Golf and Country Club as your venue for you event. 1. Great Golf in a Beautiful Setting! Carved from Florida’s rich landscape, Heritage Isles is everything Florida golf was meant to be. Architects, Gordon G. Lewis and Jed Azinger, dedicated themselves to preserving the land’s rustic beauty to combine a course that is not only challenging but extremely enjoyable. The course sets itself apart as it maintains an untouched glory through the preservation of 15 acres of natural wetlands and a thriving animal population. 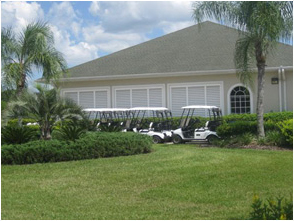 Call 813-907-7447 to find out more holding your next event at Heritage Isles! 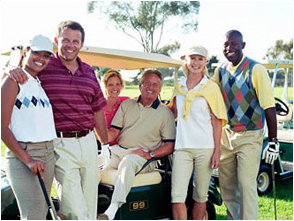 Our golf outing packages are designed with your needs in mind. Our managers will assist you through the planning stages, donate gifts and prizes from our golf shop for your event, and provide clinics and golf instruction for tournament participants. We offer complete event packages that leave nothing to chance. If you prefer, you can create your own customized package to meet your group’s exact needs. Being the coordinator of your event doesn’t mean that you can’t have a good time with the rest of your group. Our friendly, courteous staff will help you with all the details of your event — player lists, handicaps, cart signs, sponsor signs — right down to the last minute requests. Every member of our team is driven to make sure that your event is a success. We will take care of everything from the moment you walk in the door. This includes marking the golf course for your events, setting up the dining area or tent to your specifications, setting proximity markers and signs where you would like them on the course, directing players to their starting holes and much more. Consider us as extra members of your team so you can enjoy your day. The course is located on a magnificent piece of property and your players will agree that it is well worth the short drive. We can be your hidden gem! Picture yourself playing a course totally submerged in nature yet just minutes from town! 5. At Heritage Isles we are committed to providing you with friendly, professional assistance. From the planning phase through the production of your event, we will be glad to customize a tournament or outing to your exact needs. We do a great many golf outings at Heritage Isles and we’d like to do even more. We can offer you a more beautiful and better maintained golf course than you can find in the area. Your business group, your charity donors, your friends and relatives will love our course and will want to come back to visit us again and again. You’re also going to find that our friendly and caring service will make your golf outing turn out exactly the way you had always dreamed of it.